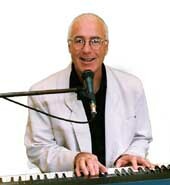 Gary Easterbrook is a professional musician with over thirty year's experience. He plays guitar, bass and piano and provides the musical accompaniment for the songs and exercises on the courses, as well as extra support for the men. Gary grew up in Whangarei, has flown airplanes, driven trucks, worked in forestry, flirted with television... the list goes on. His musical career has been equally varied - from heavy rock to bluegrass and country, blues and jazz to world music. He learned piano as an eleven year old, took up guitar at fourteen, then bass guitar and back to piano (with a dabble on drums along the way). He's now happy on all these instruments, and also arranges music for choirs. Gary can provide backing tapes for singers, and charts for musicians. Besides music, Gary loves surfing, sea kayaking and photography.